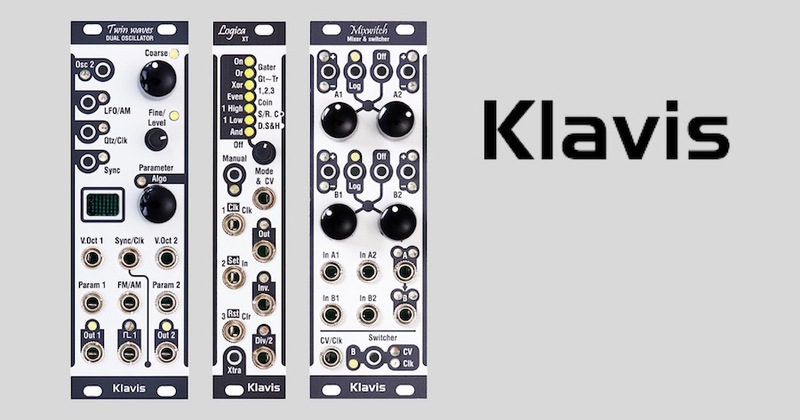 Klavis are one of those brands that cannot help themselves when it comes to taking a specific type of module and wringing every last drop of potential from it! …and their new module – LOGICA XT – is no exception. Even with their first release – the hugely popular TWIN WAVES – they managed to not only squeeze two VCOs into 8hp, but also implemented a huge range of synthesis algorithms and the ability to use either oscillator as an LFO. They have been very responsive to user requests, and it has been impressive to watch the module mature even further. The newest offering from Klavis is the LOGICA XT. This is an expanded and improved version of the already feature-packed LOGICA GATER – which had already raised the bar when it came to logic and gate processing, offering voltage control over the logic algorithm to be applied and a whopping NINE logic functions to choose from. LOGICA XT is built upon the foundations of its acclaimed predecessor, and this new version drastically expands the feature set within the same footprint. All the original goodies are still there, now enriched by a full list of state-based logic functions – including a delay line – for a total of 14 processes. Faster processing allows perfect handling of audio signals. User editable settings are stored in non-volatile memory. We also have stock of the recently released MIXWITCH – Firstly this is a high quality mixer, with the following features: click-less muting and polarity inversion; Lin or Log pot response; LEDs to show level & polarity; DC offsets generated when signal absent. Secondly it performs a number of switching processes: Switch among 4 inputs, only 2, or disabled; Select an input sequentially with a clock/trigger; Select an input randomly with a clock/trigger; Select an input in relation to a control voltage. CV and clock control are audio rate capable, so more experimental uses are also possible!